Krynicki has a rare gift of naming things even in shortest poems, he goes straight to the essence. Among Polish poets and readers he has the reputation of a master, of an archer who never misses. So Ryszard Krynicki begins the early lyric that gave his 1969 debut volume Act of Birth its title (a poem which ends: “I live / in the place of death”). These are not simply metaphors. One of the greatest poets of postwar Poland, Krynicki was born in 1943 in a Nazi labor camp in Austria, where his parents, Polish peasants from Ukraine, served as slave laborers. Act of Birth marked the emergence of a major voice−alongside Adam Zagajewski and Stanislaw Baranczak−in Poland’s “Generation of 68” or “New Wave.” Political and poetic rebellion converged, and the regime took notice. During the 1970s and 80s, Krynicki was arrested on trumped-up charges, dismissed from work, and forbidden from publishing. But to read his poetry as purely political would be a mistake. The early lyric “Act of Birth” displays the acute linguistic and ethical sensitivity at work. A distinctive combination of mysticism, compression, and wit shapes Krynicki’s writing from the early dissident poems to his late haiku. Small wonder that his influences span the distance from Issa to Zbigniew Herbert, and include Nelly Sachs and Paul Celan (both of whom he has translated splendidly). Himself an editor, publisher, and acclaimed translator, Krynicki has won major prizes, from the Polish Poets’ Award to, most recently, the 2015 Zbigniew Herbert International Literature Prize. A powerful and unique poet. Krynicki’s crystalized poems resemble prayers. 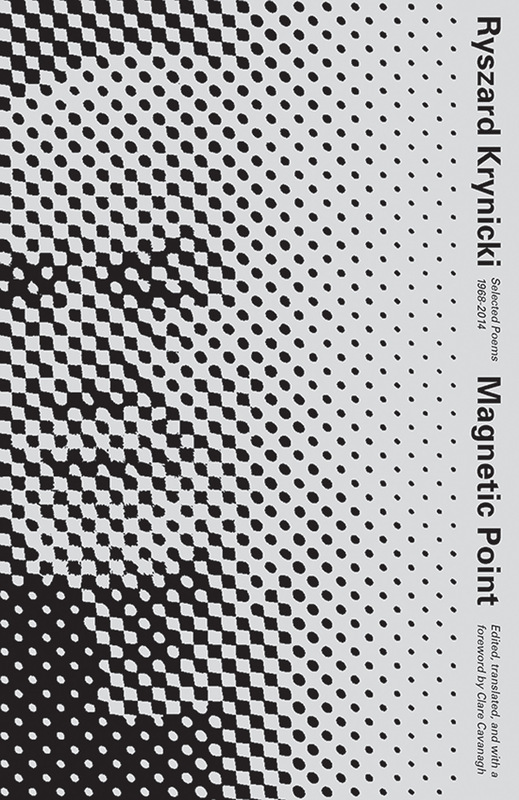 Magnetic Point should be on the shelf of everyone interested not just in contemporary Polish poetry but also those who crave poems that work against the grain. Here we have a poet whose quietude rings truer than many a thundering pronouncement uttered in the service of this or that politics or aesthetics. Master of luminous detail and a well-turned phrase, Krynicki’s poems, even the exceedingly short, rarely fail to move us. A revelation. And a treasure. I thought I’d known most of the current Polish poets—but here was a glaring omission. He writes with an undercurrent of horror, and yet affirms the sacred, making me believe in the power of poetry to redeem us. As he writes, not without some irony, ‘the world still exists.’ His translators are superb. Clear water knapped to obsidian sharpness— this is the quality of Ryszard Krynicki’s poems. Krynicki plays on his almost-impossible instrument a human music unheard elsewhere. Within its notes: personal history; politics; the earth’s beings, salts, and resins; friendships and eros; ferocity and acceptance; the pages of newspapers and cities; mortality’s subtle explorations. This long-awaited translation brings to English-language readers a poet who retunes the ears. Krynicki’s work is greatly compact—it resists what Herbert [Zbigniew] called ‘gibberish from the tribune black newspaper froth,’ and aspires to a kind of sacred speech. These are spellbinding poems: hieroglyphs, ‘reports from the agents of secret reality,’ traces left by the poet Issa reincarnated as a snail. In Clare Cavanagh’s English, Ryszard Krynicki’s Polish courts silence and flickers in paradox. It’s a chaste and dire art: political, private, inviolable. I’m transfixed. Here’s poetry doing its true work in two languages at once.